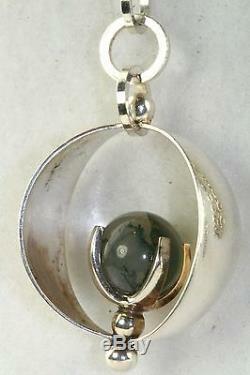 This item for sale is a most unusual, rare, vintage, signed KUPITTAAN KULTA Finland, sterling silver and 11mm moss agate gemstone orb pendant and matching singed 23 inch neck chain in excellent gently used condition. It weighs 13.7 grams. 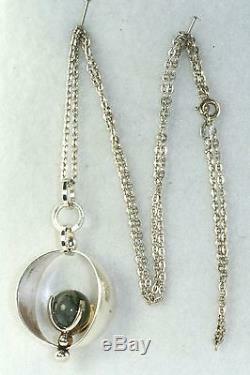 The pendant alone is 2 inches tall with top loops and 1 inch across. A wonderful addition to your collection. Or whatever you are interested in seeing culled for you from the many pages of our fine and vintage jewelry listings. The item "VINTAGE KUPITTAAN KULTA FINLAND STERLING SILVER MOSS AGATE NECKLACE" is in sale since Tuesday, June 16, 2015. This item is in the category "Jewelry & Watches\Vintage & Antique Jewelry\Vintage Ethnic/Regional/Tribal\Scandinavian". The seller is "peepsnmeems" and is located in WE LOVE TO COMBINE SHIPPING FOR YOU!!!. This item can be shipped to United States, Canada, United Kingdom, Denmark, Romania, Slovakia, Bulgaria, Czech republic, Finland, Hungary, Latvia, Lithuania, Malta, Estonia, Australia, Greece, Portugal, Cyprus, Slovenia, Japan, China, Sweden, South Korea, Indonesia, Taiwan, South africa, Thailand, Belgium, France, Hong Kong, Ireland, Netherlands, Poland, Spain, Italy, Germany, Austria, Russian federation, Israel, Mexico, New Zealand, Philippines, Singapore, Norway, Saudi arabia, United arab emirates, Qatar, Kuwait, Bahrain, Croatia, Malaysia, Brazil, Chile, Colombia, Costa rica.